For all of you wondering how I have my SageTV box, a VCR/DVD, and a cable converter hooked up, here goes. Input from the cable is split 4 ways. Leg 1 goes to VCR/DVD Antenna In. Leg 2 goes to the SageTV Antenna In. Leg 3 goes to the cable converter Antenna In. And finally, Leg 4 goes to the TV Antenna In. The SageTV box also takes a Line In from the cable converter's Line Out. This uses the Left and Right audio outputs and an S-video output. The SageTV also outputs Line Out that goes into the TV Line 3 In. 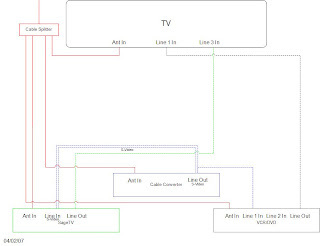 The cable converter's ins and outs have been previously described except that the Left and Right audio outputs and Composite video are split and also go to the VCR/DVD Line 1 In. Originally, this was done so that I could record on the VCR from the cable converter which is no longer necessary. The VCR/DVD Line Out goes into the TV's Line 1 In. Yeah, it's a mess behind that entertainment center.